Let’s accept it, Sri Lanka is in a serious debt crisis. We owe a staggering Rs. 9.5 trillion and the current Government is facing an uphill task to reconcile and recommend a way forward. Experts recommend that the way to get out of this trap is to increase direct taxes and privatise loss-making state-owned enterprises (SOEs). But many forget that in a political economy like ours and with a coalition government at play, this is almost impossible. The latest numbers emerging state that total outstanding debt as at end 2015 was Rs. 8.5 trillion, which is 76% of GDP, up from the 70% as at end 2014. This, on the 2014 exit number, is an increase of Rs. 1,112.3 billion. While it is difficult to break down overall debt in terms of how much we owe whom, one of Sri Lanka’s top foreign exchange earners, Ceylon Tea, which generates over a $ 1.5 billion in revenue for Sri Lanka and provides almost a million jobs to the economy today, is also challenged due to the global economic turmoil in key tea importing countries. What is sad is that with some innovative decision-making by the industry in the past through a strong private-public-people partnership, Sri Lanka has earned the respect of being an example to the world across the value chain – from being a grower of tea and a producer of the best quality tea worldwide to having the most admired tea auction system in the world. From the available data, the wage rate has catapulted from Rs. 290 five years back to Rs. 620 as at 2013, which is an increase of 114%. But the net sales prices from the auctions reveal that in 2008 the average was at Rs. 310 per kg and prices have picked up to a around Rs. 400, which reflects only a 29% increase. This indicates the supply chain and demand generation tipping point that the industry has come to. 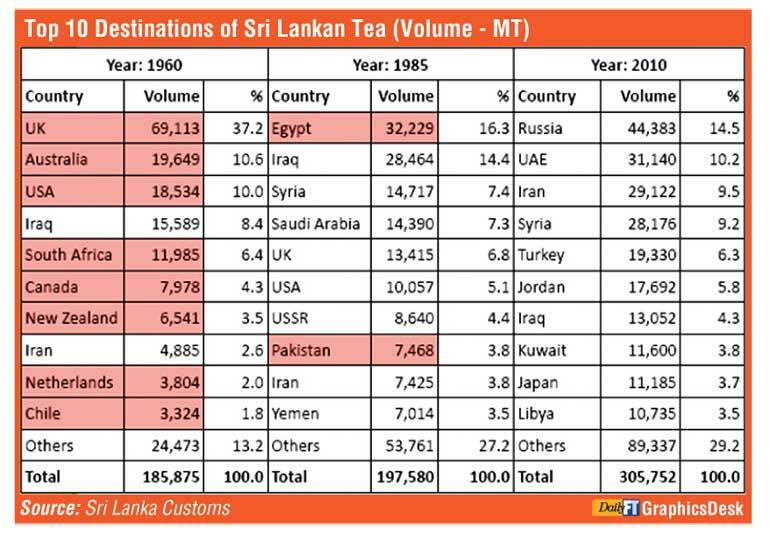 It also reflects the poor policymaking (due to the political economy of Sri Lanka) that has resulted in Ceylon Tea going outside the grain of competitiveness as an industry. The Government’s decision to withdraw the fertiliser subsidy and the impact of banning the use of the weedicide Glyphosate along with the newly-introduced charge for cash withdrawal for worker wages adds a further Rs. 5.3 billion to the Regional Plantation Companies’ (RPC) total expenditure. The cost of this additional expenditure would have an additional impact of Rs. 58 per kg of tea which reveals the issues in the industry. While some can say that the workers in a tea plantation must be remunerated as per the increasing quality of life just like other parts of the country, a point that needs to be noted is that if the Cost of Production (COP) becomes greater than the Net Sales Average (NSA), the industry becomes nonviable and this can lead to the collapse of the entire industry. For instance, a Rs. 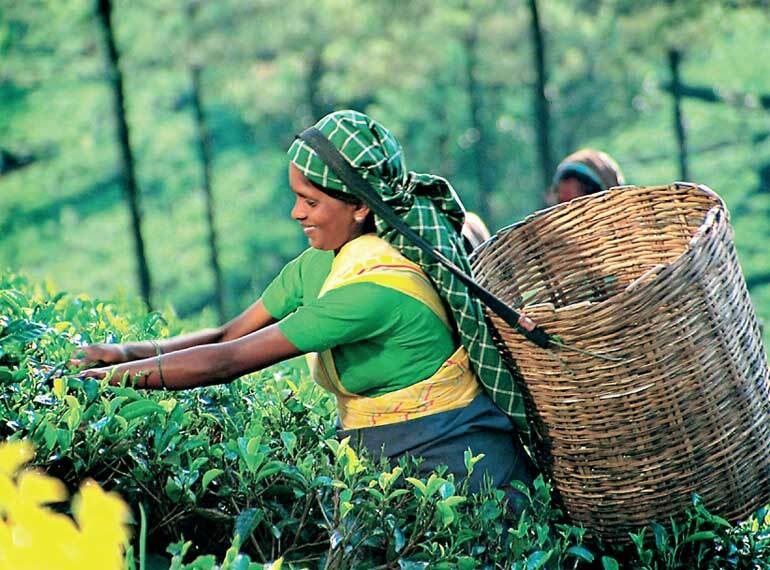 1 increase in labour wages increases the production cost of tea by approximately Rs. 0.52 per kg. With the demand of the unions for a daily wage of Rs. 1,000 (an increment of Rs. 312) the production cost will become Rs. 162.20, pushing the tea produced by the RPCs outside the purchasing price of a global buyer. Due to the labour-intensive nature of production (RPCs collectively employ around 193,000 workers), a Rs. 1 increase in the daily wage of an estate worker will increase the annual expenditure incurred collectively by the RPCs by Rs. 66.6 million. This means that if the demand of the trade unions for a daily wage of Rs. 1,000 is met, the annual cost incurred on labour wages alone by the RPCs will increase by an astronomical Rs. 20.8 billion. This is unthinkable given the present reality. What is sad is that while the focus must be on the demand side of the business given the outward-looking Government in power, the focus is still more on the supply chain and political implications than on the business reality. "This is the power of tea on the world stage and it is up to brand marketers to make it a major industry in my view. Globally, tea prices have surged as consumption growth has outpaced the increase in production by 3.4%. In some developing markets like Russia, demand has shifted from more fashionable and expensive drinks to traditional, lower-quality tea that has put pressure to develop new business models like the use of multi-origin teas"
If I briefly go back to 1992 when the State opted to privatise the management of State plantations, 23 RPCs were set up, of which 20 were leased out to 12 management companies during the period 1992/1993, resulting in the conversion of 461 estates managed by the JEDB and SLSPC to 20 RPCs under the Companies Act No. 17 of 1982. The new management architecture resulted in the best tea plantation managers being absorbed by private sector corporations during the post-privatisation period. The RPCs turned the Rs. 1.5 billion loss-making venture towards profitability. But we see that by 2016, the hard work done by the private and public sectors is coming apart and now some quarters of the private sector want to give back the RPCs to the State. One key ramification of the situation at hand will be the impact it has on the key biological asset - tea plants. While for some it can be a secondary health check, the reality is that of the total extent of Old Seedling Tea (OST) in Sri Lanka, 75% belongs to the corporate sector with only about 15% having bushes younger than 60 years of age while the rest are well over 60 years. Hence it could be said that the old tea bushes are one of the main reasons for the declining productivity and correspondingly lower production volumes that Sri Lanka has witnessed. A key remedial program that can be implemented is a robust replanting program in the RPCs. But with the current issue of COP converging on NSA, this remains a statement on paper that cannot be implemented practically. One case study by the Tea Research Institute states that an output of approximately 126 kg million from the corporate tea sector will decline to 98 kg million of tea within the next five years as the tea in this sector is at an advanced age and its yield is declining rapidly. If one quantifies the loss to the country in volume terms it will be around 28 kg million of tea per annum and in value it will be $ 92 million while in rupees it will be a colossal Rs. 9.9 billion. The Tea Research Institute stipulates that the replanting rate must be around 3% in a healthy agricultural practice system. But once again this action has been confined to paper as its financial viability is in question. Conglomerates and companies involved in tourism, renewable energy and education can be more attractive business ventures than the tea sector. One can just imagine the pressure in the boardroom for the business heads of agriculture. Hence it is clear that unless some serious policy decisions are taken based on market dynamics, Sri Lanka’s corporate tea sector will be heading towards very rough waters. Many people forget that the tea industry was the first privatised entity in Sri Lanka and it has kept Sri Lanka alive during the country’s three decades of war. Now that peace has returned the need of the hour is strong and structured decision-making in a balanced manner between the private and public sectors. On the politically sensitive issue of wages, one way to address concerns is to implement a variable pay structure for employees. Let’s say the total package is Rs. 1,000 per month for an employee. From this one can get Rs. 700 as fixed pay and Rs. 300 as variable pay. In this case, the employee will always get Rs. 700 at the end of the month. Now let’s suppose this employee announces the percentage of variable pay to be 80%. The employee will then get (80% of the variable pay 300 which is equal to Rs. 240), so at the end of the quarter he or she will get 240*3 = Rs. 720. Which can be attractive but the challenge is can such a decision go thorough given the local elections in the offing early next year. Given the trend of international supermarket and hypermarket chains entering countries targeting the middle to lower economic consumer groups which are in fact upgrading their lifestyle from general trade to hypermarkets, retailer brand partners are becoming a key decision-maker in the purchase decision. Hence we see a huge shift from traditional relationships that have been practiced over the years, which means Sri Lanka will have to adjust to a new business model. A brand owner of today must be ready for a higher entry cost such as paying for shelf space, higher trade margins and lower marketing margins where consumers have a general affinity to a retailer, at the expense of the brand owner. Many scientists are researching the various health benefits of tea, including how it reduces the risks of cancer, while specialty teas are a rapidly expanding subset of global tea consumption and in fact have outpaced regular tea in countries like Canada while in the United States approximately 85% of tea is been consumed as iced tea with its competitor being sodas and water, an interesting development on the concept of share of throat. This is the power of tea on the world stage and it is up to brand marketers to make it a major industry in my view. Globally, tea prices have surged as consumption growth has outpaced the increase in production by 3.4%. In some developing markets like Russia, demand has shifted from more fashionable and expensive drinks to traditional, lower-quality tea that has put pressure to develop new business models like the use of multi-origin teas. On the other hand, in developed countries, gourmet tea has been an “affordable luxury” and sales have remained strong. The 2,600 specialty tearooms in the US are growing but soft drink consumption is still huge despite some resistance due to their association with obesity and diabetes resulting in a decline in usage. If we look at the broader beverage market, water is moving towards a new domain, becoming flavoured and fortified with vitamins, while sports drinks are marketed to athletes as energy drinks with massive amounts of sugar and caffeine along with Guarana, Ginseng and Taurine. Then there are drinks which are “energy shots” offering concentrated caffeine and other chemicals to provide instant boosts of energy, which are the new forms of competition for the world of tea. Against this backdrop we see that every 15 years Sri Lanka loses half of the key markets it operates in which shows us the challenges we are up against in the demand and supply chain side that needs addressing. This must only be done on a PPP consultation.